LabKey Server can do more than just present your data to the public. Your audience can use LabKey to re-run and validate your analyses, explore alternative hypotheses, or export the data to perform their own investigations. When presenting data online, LabKey Server lets you refine exactly which data you want to show, and how. Publishing data with LabKey Server is about creating relationships between data and selected audiences. The general public can be shown one profile of the data, while fellow researchers can be shown a different, more complete, profile. In either case, protecting the confidentiality of research subjects is always paramount. To help protect Protected Health Information, LabKey can de-identifying data by randomizing subject IDs, shifting date values, and masking clinical site names. The upcoming compliance module gives you the ultimate control over data presentation, by letting you restrict visibility with fine-grained permission controls, and by providing deep auditing, so you can see which researchers have looked at which rows of data, and why. ITN TrialShare is a research web portal for both operational data management and post-publication sharing of data from clinical trials used by the the Immune Tolerance Network, a multinational effort that encompasses over 100 investigators, over 40 phase I/II clinical trials, and over 100 sites. In response to the declaration of the Zika virus as a public health emergency, LabKey has launched the Zika Open-Research Portal to help facilitate collaborative research. 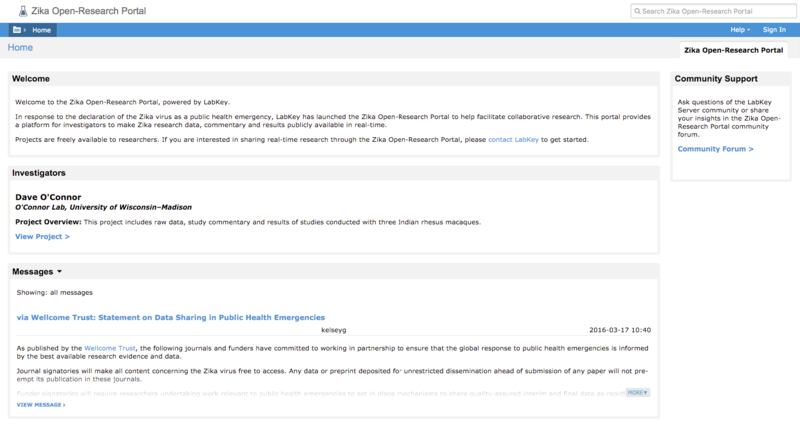 This LabKey hosted instance of LabKey Server provides a platform for investigators to make Zika research data, commentary and results publicly available in real-time.